Series Y-harness with Traxxas High Current Connectors Discounts Apply ! 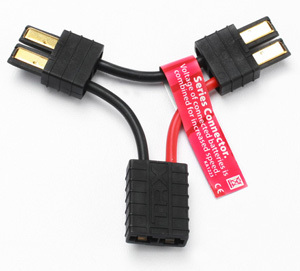 TRA3063 - Series Y-harness with Traxxas High Current Connectors. Only Traxxas Y-harnesses let you run dual-battery power for increased speed or runtime with the proven convenience and performance of genuine Traxxas High-Current Connectors. Use the series harness to combine battery voltage and unlock the 50+mph speed potential of your model. Dual-battery operation requires attention to precautions outlined in the model's owners manual. Follow all precautions to assure peak performance and reliability of your model and batteries. Traxxas parallel and series Y-harnesses are for use with 2/3A battery packs only.